Did you ever have cups with the Kool-Aid guy's face on them when you were younger? We did, and I remember loving when my mom made this slushie for us to drink in those cups. Good memories! I don't have those cups for my boys, but we still love making the slushie. My husband is actually the biggest Kool-Aid fan at our house. We don't ever drink it until summer hits. 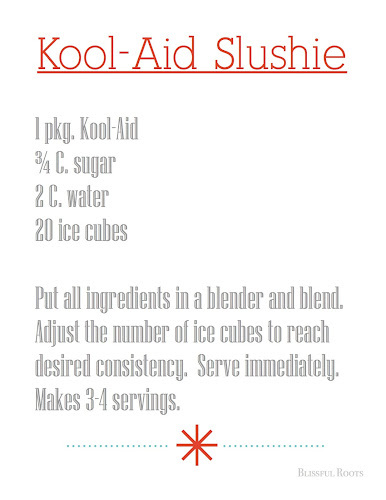 The good thing about this slush is that it only calls for 3/4 cup sugar instead of a whole cup (that's good, right? I'll keep telling myself it is). You can use any flavor of Kool-Aid for this. We used tropical punch for the red one in the picture, and it's one of my favorites! There's a new watermelon flavor that Kool-Aid makes, and it's my husband's new favorite. It's fun to experiment with the flavors. You could even try mixing a couple. It really is the perfect way to cool down on a hot summer day! Thanks so much for stopping by, Jeni. Happy Wednesday! Come back anytime! This would be refreshing to have right now! We are headed to the 90's today with high humidity! Thanks for sharing! We're close to the 90s today also, but no humidity. You definitely need to blend up a batch and cool off! Thanks so much for stopping by! Good luck staying cool. This looks so good. We have a blog hop and would love to have you share your posts. Here is the link. Thank so much for the invite girls. I'll head on over now. Enjoy your weekend! Hey, Dana! Thanks so much for taking the time to stop by and visit. And yes, I love how fast this slushy comes together. Thanks for the invite. I'll stop by. Have a wonderful weekend! Yum! I think it also would be good with some alcohol for the grown ups ;) Thank you so much for sharing at Give Me The Goods Monday! 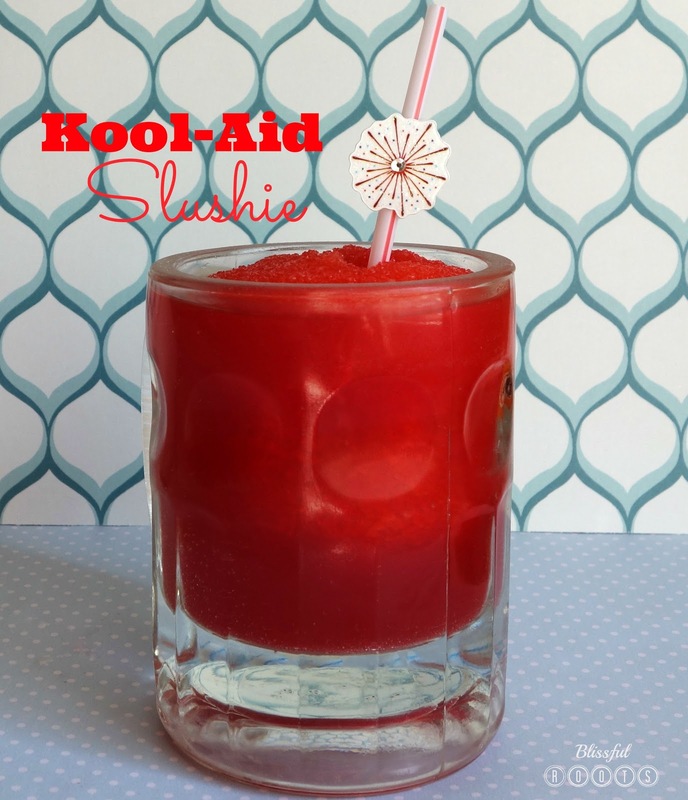 That's so funny your mom used to do that because now that I've made the slushie myself, I've thought about using 3/4 C. every time (even in plain Kool-Aid). Now I know I should. Thanks so much for taking the time to visit and comment. I sure appreciate it! Stop by anytime! At the end of a long day, cooking in the kitchen is my favorite place to be.